Our selection of painted and mango wood TV cabinets means you can bring a bit of whimsy into your living room, while still enjoying a high quality piece. Bring the look of our lovely furniture into your living room with our great selection of painted and mango wood TV cabinets. Made from 100% solid hardwood, and skilled construction techniques, these TV stands will look great in any decor scheme. 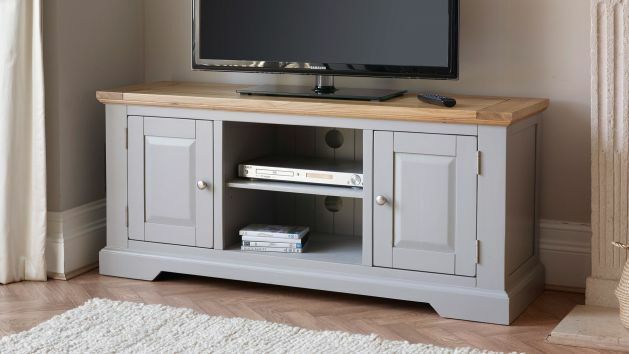 We've designed three special shades of paint colour for our painted television units, which perfectly coordinate with our solid oak furniture. The creamy smooth finish is pleasing to the eye, and brings out the beautiful tones of both our natural and solid oak finishes on the top. Our mango ranges are finished with a clear protective wax to allow the exotic wood grain to shine through. The open shelf is perfect for storing your TV box, media player, gaming console, or internet router, and with an exit hole at the back of the shelf, cables and power cords are hidden out of sight. Cabinets and drawers - with solid hardwood bases, backs, and runners, and real dovetail joints - help hiding DVDs, remotes and more out of sight. Browse our fantastic selection of painted and mango TV cabinets today!